Carte Nouvelle de l’ Amerique Angloise contenant tout ce que les Anglois possedent sur le Continent de l’Amerique Septentrionale…. By Mathias A. Lotter. Published by M. A. Lotter, Augsburg. Copper plate engraving, c.1776. image size 23 5/8 x 19 3/8 inches plus margins. Good condition, with original color. LINK. This is one of the great maps issued at the beginning of the American Revolution. 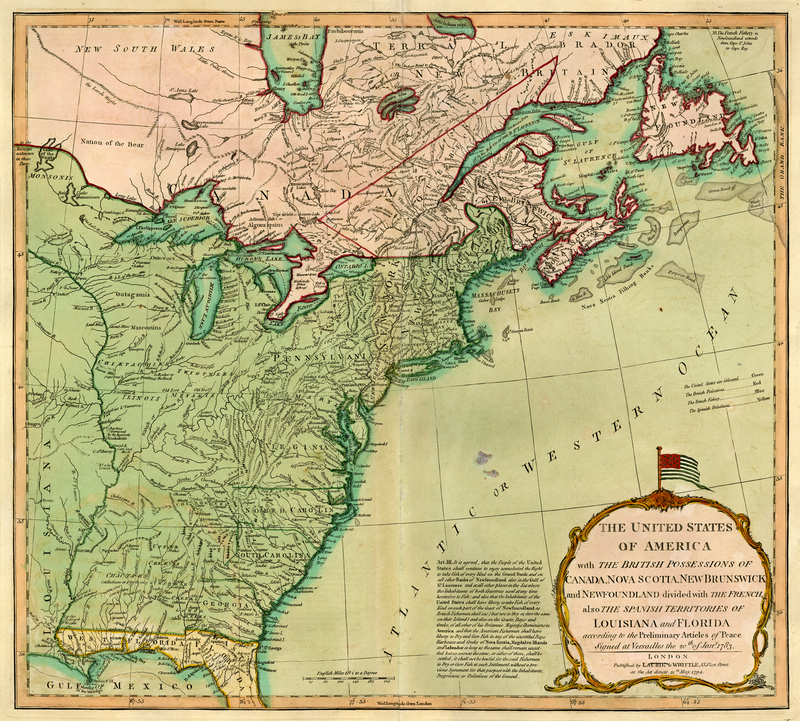 Published in Augsburg, this map depicts the 13 British colonies and Florida just prior to the outbreak of Revolutionary conflict. The map shows the colonies in great detail, albeit with unusual borders (particularly Maryland). The map covers the area from the James Bay to the Gulf of Mexico and west to Lake Michigan. Shown are provinces, towns and cities, rivers and the Great Lakes. West of the Appalachian mountains, the Ohio valley is depicted with considerable detail, noting Native American settlements and prominent forts of the French and Indian War. 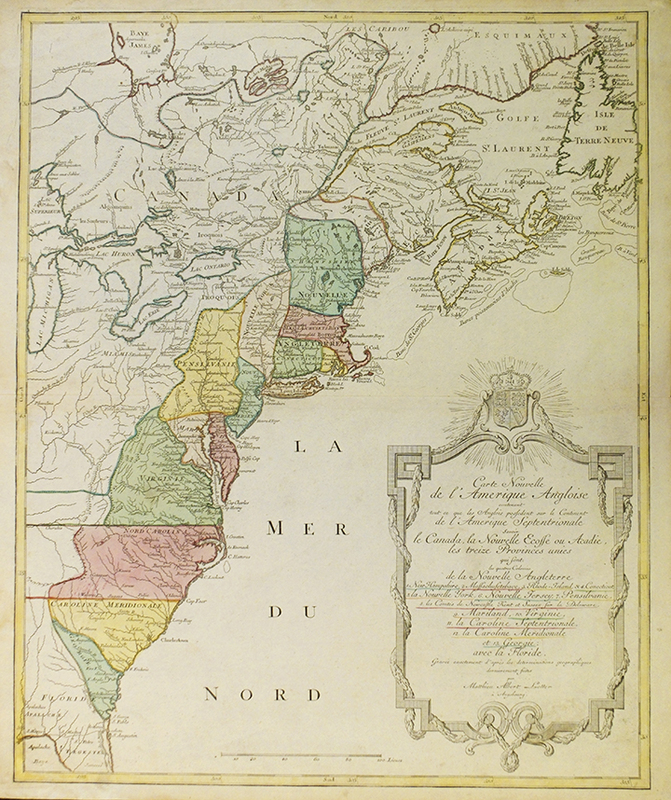 The map clearly appeals to French sentiments, limiting the claims of the British to the regions east of the Appalachian Mountains. Additionally, the title is written in French, which is rare considering the map is by one of the leading 18th century German publishers, Mathias A. Lotter. To the right of is the title of the map and a list the 13 colonies, along with of Florida and Canadian settlements. It is enclosed in a decorative cartouche, on top of which sits the gleaming royal crest of the United Kingdom. Today we are sharing stunning 18th century engravings from Volckamer’s “Nurnbergische Hesperides.” A wealthy Nuremberg merchant who had his own fine orangery, Johann C. Volckamer engaged a variety of artists and engravers, including the architectural artist Paul Decker, to produce plates for this distinctive work. 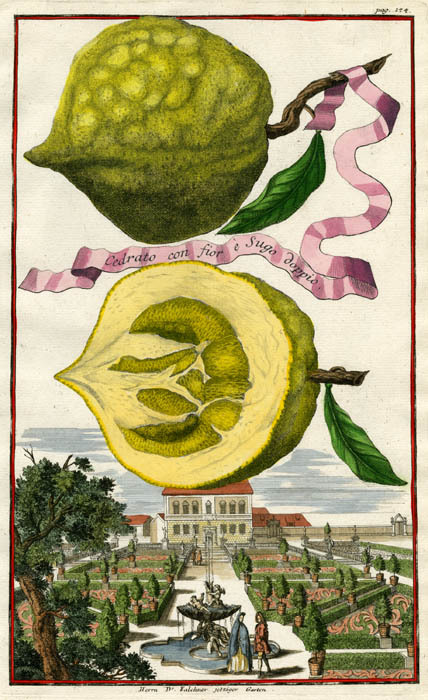 Most of the plates are devoted to citrus fruits, bedecked with ribbon and positioned above views of the gardens, town squares, and palaces of Germany, Austria, and Italy. These unusual engravings are prized for their unique combination of botanical illustrations and 18th century garden designs. Cedrato con fior e Sugo doppio. Page 174. Johann C. Volckamer. Published Nuremberg. Copperplate engraving, hand-colored, 1708-14. From Volckamer’s “Nurnbergische Hesperides.” LINK. In the 18th century, most European gardeners were moving away from ornamental gardens and towards practical gardening of vegetables, herbs, and fruits. 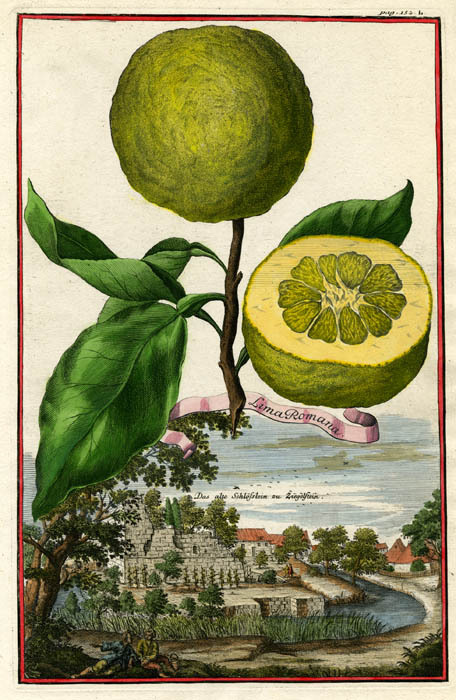 Gardens in colder planting zones were enclosed against insects, vermin, and the chilly climate, gifting the gardeners an opportunity to grow and cultivate citrus fruit trees for the first time. 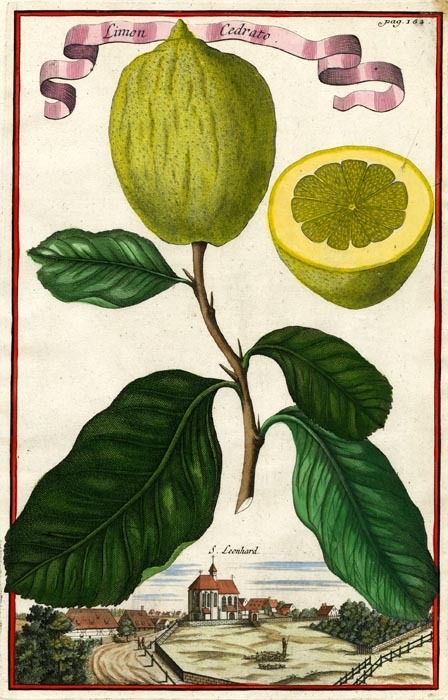 While the culture of fruit was the subject of many books- gardeners manuals with instructions as to care and pruning were in abundance- there were comparatively few illustrated books dealing with fruit alone in the beginning of the century. 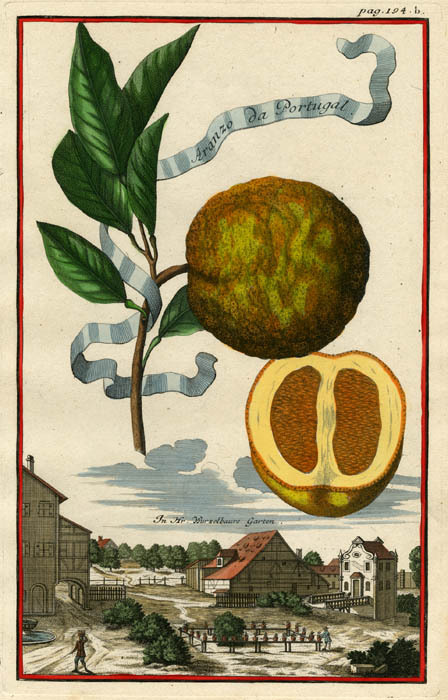 Published in 1708, Volckamer’s “Nurnbergische Hesperides” was one of the first illustrated books dedicated to citrus fruits. Limon Cedrato. Page 68. Johann C. Volckamer. Published Nuremberg. Copperplate engraving, hand-colored, 1708-14. From Volckamer’s “Nurnbergische Hesperides.” LINK. Limon Cedrato. Page 162. Johann C. Volckamer. Published Nuremberg. Copperplate engraving, hand-colored, 1708-14. From Volckamer’s “Nurnbergische Hesperides.” LINK. 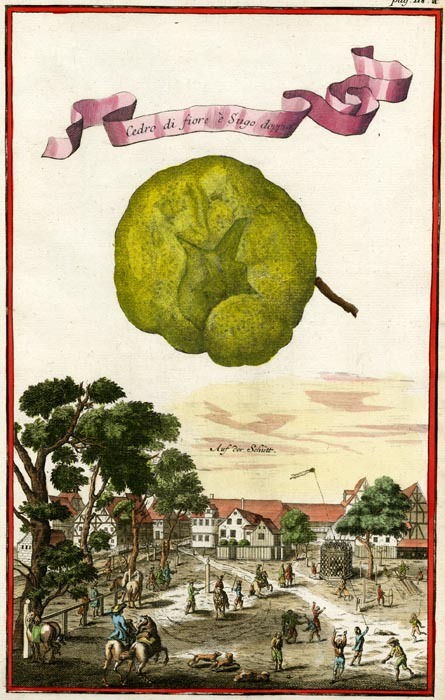 The first volume of “Nurnbergische Hesperides” contained 115 plates, mostly uncolored. Separated into 5 parts, the book’s first four sections focus solely on citrus fruits, while the fifth is devoted to flowers. The plates were engraved by L. C. Glotsh, and were the work of artists P. Decker, B. Kinkel, and I. C. Steinberger. A continuation, or second volume, of “Nurnbergische Hesperides” was published in 1714, with 132 plates. 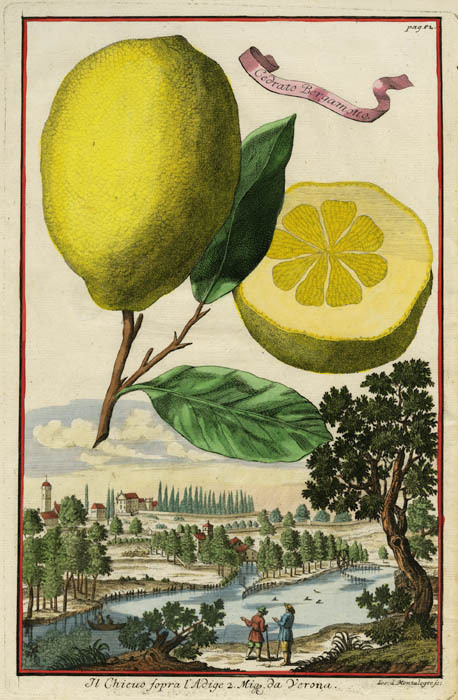 Again, the plates depict mostly citrus fruits, with the exception of the last section, which highlights pineapple, palm, and coconut trees.The plates were engraved by J. C. Dehne and J. Montalegre, and were the work of artists Delsenbach, T. G. Beckh, Krieger, and F. P. Lidner. Aranzo da Portugal. Page 194b. Johann C. Volckamer. Published Nuremberg. Copperplate engraving, hand-colored, 1708-14. From Volckamer’s “Nurnbergische Hesperides.” LINK. 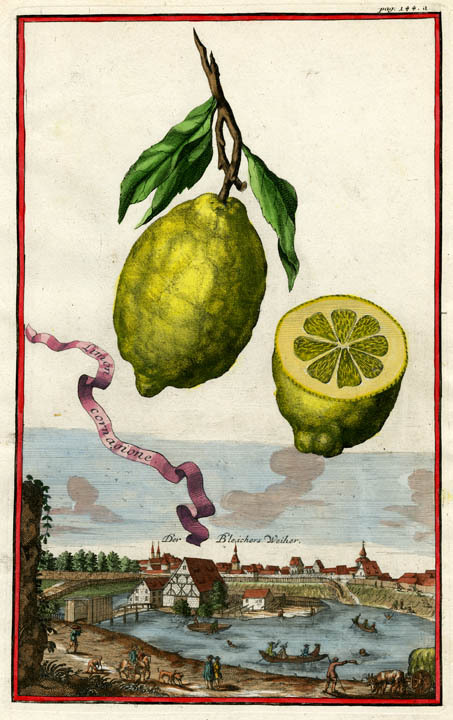 Limon cornagione. Page 144a. Johann C. Volckamer. Published Nuremberg. Copperplate engraving, hand-colored, 1708-14. From Volckamer’s “Nurnbergische Hesperides.” LINK. Cedrati musciati. Page 61. Johann C. Volckamer. Published Nuremberg. Copperplate engraving, hand-colored, 1708-14. From Volckamer’s “Nurnbergische Hesperides.” LINK. 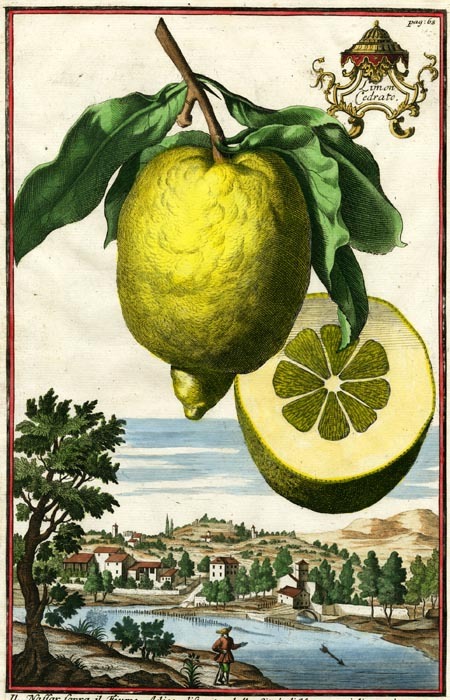 Cedro di fiore e Sugo doppia. Page 118. Johann C. Volckamer. Published Nuremberg. Copperplate engraving, hand-colored, 1708-14. From Volckamer’s “Nurnbergische Hesperides.” LINK. Lima Romana. Page 152. Johann C. Volckamer. Published Nuremberg. Copperplate engraving, hand-colored, 1708-14. From Volckamer’s “Nurnbergische Hesperides.” LINK. 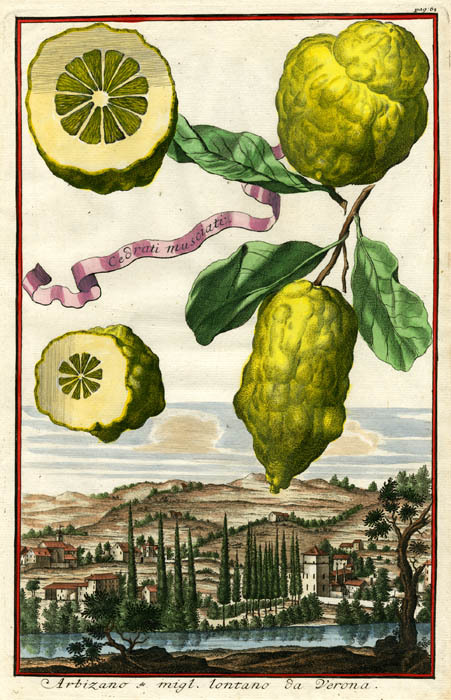 Cedrato Bergamotto. Page 52. Johann C. Volckamer. Published Nuremberg. Copperplate engraving, hand-colored, 1708-14. From Volckamer’s “Nurnbergische Hesperides.” LINK. 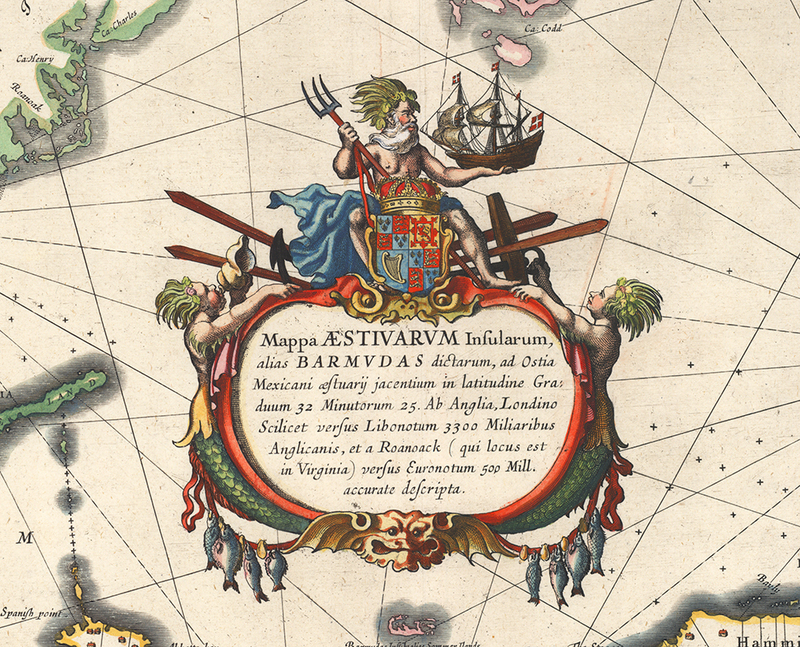 Mappa Aestivarum Insularum Alias Barmudas Dictarum. . . . By Willem J. Blaeu. Published by W. Blaeu, Amsterdam. 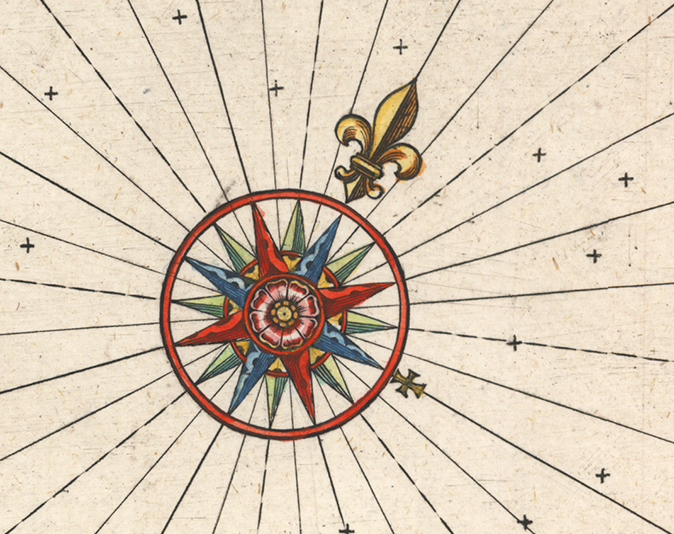 Handcolored copper plate engraving, c.1633. Image size 15 5/8 x 20 11/16″ (396 x 525 mm) plus margins. French text on verso. Good condition save for paper toning, slight fading and marginal mat line. Original coloring. LINK. 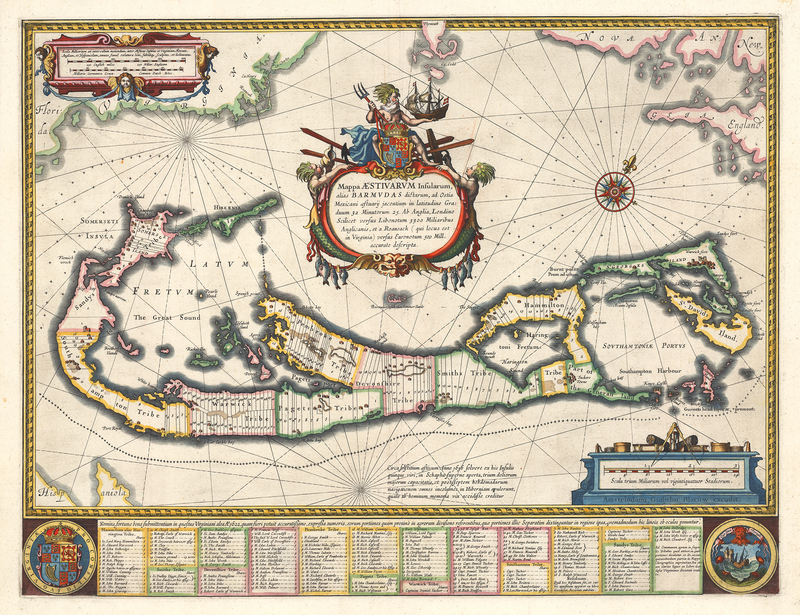 Today we are sharing this stunning c.1633 Willem J. Blaeu map of Bermuda. 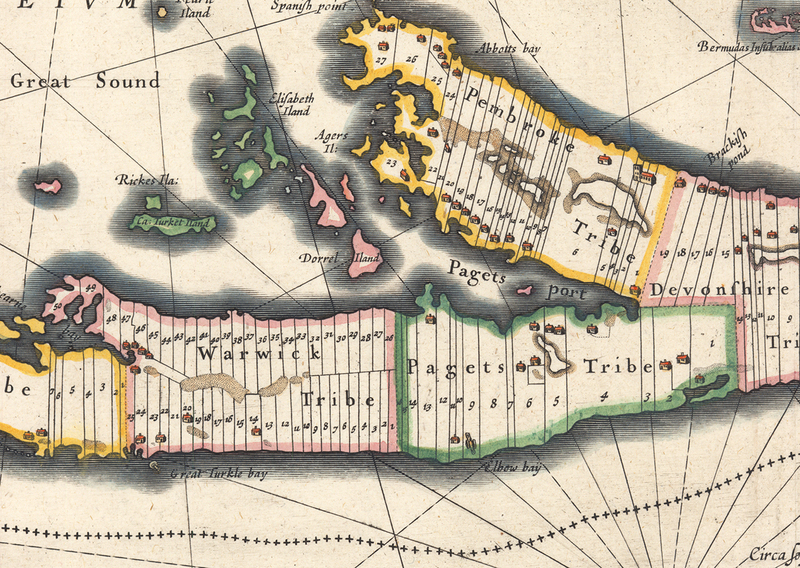 Cartographically, this map was based upon Richard Norwood’s 1618 survey for the Bermuda Company. The map shows the division of land into “Tribes”, a short-lived name for what later became administrative parishes. Many tiny houses dot the map, locating settlements, along with a scattering of minute cannons, marking the defensible points. At the bottom is a color-coded chart listing both the Bermuda Company stockholders and the landowners, in twelve columns. (detail of) Mappa Aestivarum Insularum Alias Barmudas Dictarum. . . . The highly embellished cartouche at center features Neptune astride the royal coat of arms of England, trident in one hand and a galleon in the other. 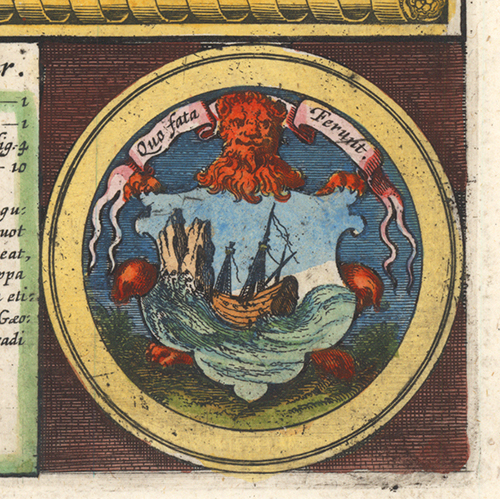 The cartouche is adorned on both sides by mermaids, as a bountiful string of fish hangs from the bottom. Many other engraved embellishments ornament this beautiful map, including a stunning compass rose, a coat of arms, and a medallion. Today we are excited to share this beautiful map of the United States and lower Canada, published by Laurie & Whittle, in London in 1794. 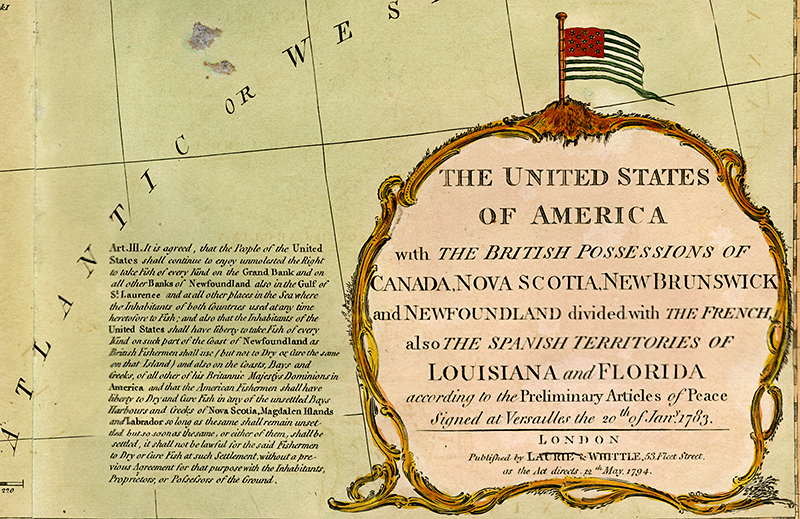 This map was published shortly after the signing of the Treaties of Versailles in 1783, and offers a nice detailed look at the original colonies, East and West Florida, and Spanish Louisiana. In the preliminary Articles of Peace signed in 1783, Spain negotiated rights to Florida, with Spain keeping West Florida and gaining back East Florida in exchange for the Bahamas. This map accurately depicts both East and West Florida in yellow, to represent Spanish holdings. 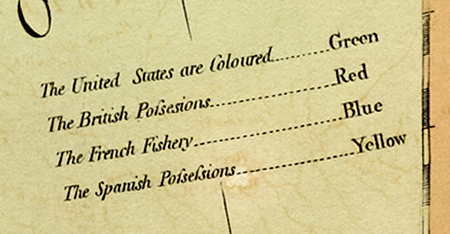 Article III of the Treaty, concerning fishing rights, is reprinted next to the cartouche, which includes one of the earliest representations of an American Flag to appear on a printed map. 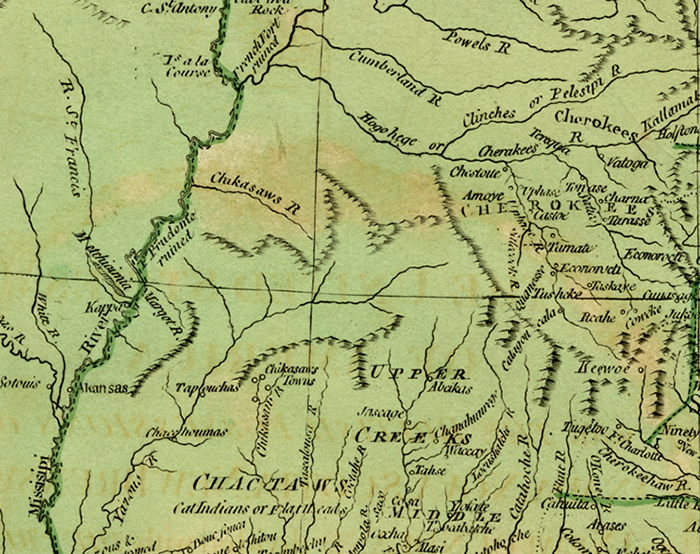 There is also excellent detail on the various Indian tribes in the Ohio and Mississippi River Valleys, including the Choctaws and the Cherokees. The Peninsula and Gulf of Florida or Channel of Bahama with the Bahama Islands. Thomas Jefferys. Printed for Robt. Sayer, Map and printseller, No. 53 Fleet Street, London. Copper plate engraving, hand-colored, Feb. 20, 1775. Image size 18 5/8 x 24 5/8″. Very good condition with attractive wash color. 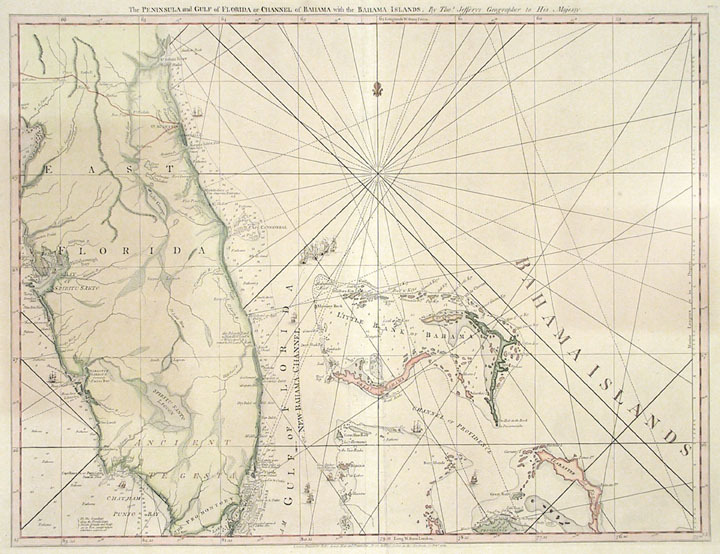 A beautiful nautical chart of Florida and the Bahama issued at the beginning of the American Revolution. Because of its large scale and great detail, it was used by both the British and French navies. Florida’s interior was still largely unexplored, but the coastal information regarding bays, safe harbors and soundings is extensive. From Jefferys’ “The American Atlas: or A Geographical Description of the Whole Continent of America…” LINK. We will be attending the 22nd Annual Miami International Map Fair with our NY partners, The Old Print Shop. We hope to see our OPG map collectors at the fair, and will be bringing down our best material. If you can’t make it down to Florida this weekend, feel free to send us your “wish list”. We can look for special, rare, and exciting maps that you want for your walls. This is a great opportunity to create or build upon your personal map collection. As one of the best and largest map fairs in the world, the event brings together top-notch dealers, lecturers, and collectors for a weekend of engaging and spirited discussion and sharing of maps. For more information on tickets, lecturers, receptions and tours, please visit the HistoryMiami website.